Your teeth give you the ability to eat so you can be healthy. They also help you pronounce your words correctly, and very importantly, give you a beautiful smile which is such a valuable social asset. Unfortunately for various reasons, it is possible for a person to lose one or more teeth.If that happens to you, you do not have to worry at all! Modern dentistry can give you your missing teeth –even a complete denture in as short a time as one dental visit. Teeth in a day with All-On-4 implants is an ideal procedure for those patients who wish to get rid of their dentures. The procedure is also suitable for those with failing teeth in need of a full upper and/or lower jaw restoration. 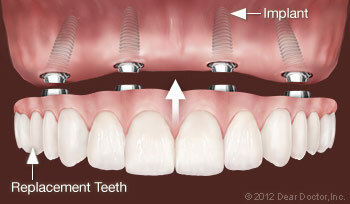 Only four implants per jaw can suffice for such a procedure to install a customized set of replacement teeth. Two implants are placed in the front of the jaw, while the remaining two are placed in the rear in a slightly tilted fashion. The entire procedure is completed in one day, just as the name implies.During the procedure for All-on-4, youwill be comfortably relaxed, and may even asleep under the effect of sedation dentistry. The procedure of All-On-4 Implant placement is pain free, and you will get a full set of replacement teeth in under24 hours. Why Should You Choose All-on-4 Implants? There are many reasons for choosing “teeth in a day” treatment.Implant-based dentures are boon for those toothless patients who have been living with problematic conventional dentures. With same-day-implants they will get immediate and improved functionality and experience a much better quality of life. Also, in most cases, the “teeth-in-a-day” procedure, almost always allows patients to avoid bone grafting.Bone grafting is needed for implants in those patients who have lost significant amounts of jaw bone in the region of the implant. With the All-on-4 denture, the usual day-to-day frustrations and discomforts of dentures are eliminated. You can enjoy your favorite foods once again, and smile at your friends with confidence. For further advice free consultation on teeth in a day, and to determine if this procedure is ideal for your dental condition, please contact our conveniently located dental office in Burnaby, BC at (604) 526-2725.